Granola bars are convenient, but like most prepared foods, convenience comes at a price. 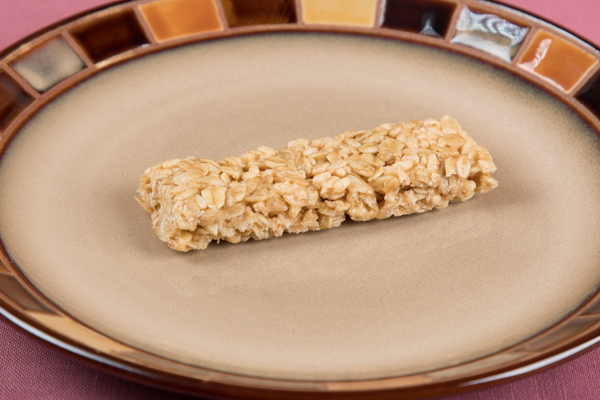 The banana granola bar pictured below is less than 1 ounce (25 g) and has 110 calories. It’s also low in sodium (40 mg). That does not seem too bad except you only get 1 gram each of fiber and protein from a whole grain food. It also comes with 7 grams (almost 2 teaspoons) of sugar. Food manufactures, love emphasizes the quality of their foods. 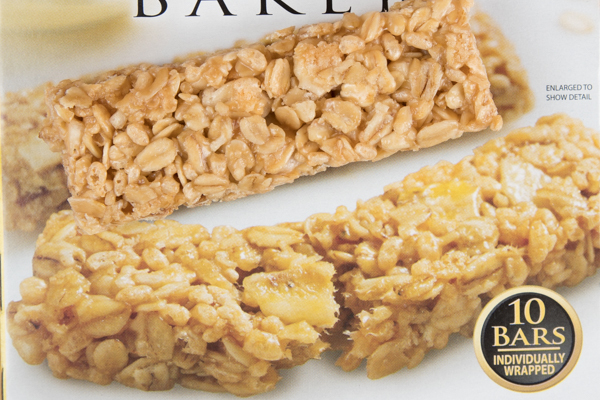 A banana granola bar should have bits of banana. That is exactly what the photo, enlarged to show detail, on the package shows. Compared to the actual product, you will be hard press finding those pieces of banana. You cannot carry Yogurt, Fruit & Granola in your pocket or purse, but it is made with natural ingredients and no artificial colors, flavors, or preservatives. While this granola bar has about 7 grams of added sugar per ounce (91 grams for 13 ounces), Yogurt, Fruit & Granola has only 5 grams of added sugar from honey. If desired, you can reduce the amount of sugar by omitting the honey or use a zero calorie sweetener. Nutrition information is based on granola providing 250 calories per 1/2 cup (55 g) serving and non-fat Greek yogurt. Using plain yogurt decreases the amount of protein to 16 grams. In a medium bowl, add yogurt, granola, and almonds. Drizzle with honey. Arrange fruit on top.